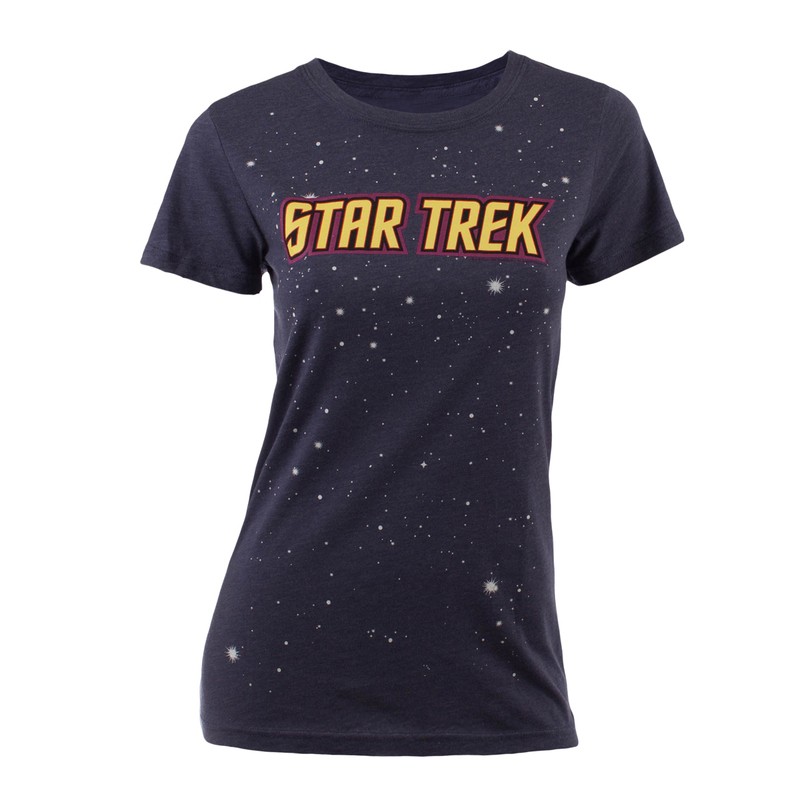 Jump on board the astrological trend with the Star Trek Logo with Stars Women’s T-Shirt. Featuring distressed-ink printing this cute tee is perfect for she-Trekkers. Love this Star Trek shirt. My granddaughter is so proud to wear it and be part of the Star Trek world. Thank you for such a well made product. The shirt does run small but I ordered a size larger and it fits just right. Glad that you have tee shirts for ladies. I see on other websites that there are too many that are basically for men and look better on men. Love the little stars on the shirt. Love this shirt, but it does fit SNUG. The pattern and imagery are great tho and would definitely recommend! As the description says, it is a juniors sized shirt. Normally, I'm a XS but I bought a medium so it wouldn't be a super tight fit. The medium is a good length and not too tight, even after washing it. I would definitely recommend ordering a size up or even two for it to fit comfortably. Product says slim fit order 1-2 sizes up. Usually wear womens small, ordered womens large and still too tight fitting. Bought in late November as xmas gift, when it was tried on after xmas, could not return/exchange due to 30 day return policy. Every store I've ever shopped at extends policy for holiday. Very disappointed - never will purchase gift items from this site again. It's a great classically cut and fitting t-shirt that's super comfortable and just so happens to be emblazoned with the awesome Star Trek logo. The colors are true to what's seen on the website and the fit was just as expected. It's soft and feels comfortable to wear all day. I'm very happy with my first purchase here! Bought as a gift for my Trekky partner. She loved the feel, coloring, design etc. However, I did not heed the warnings/notifications on sizing. It is a true junior fit. It will be form fitting. I'm sending mine back in for a larger size. Great shirt, but came with a big hole in it. So double check all of the shirt before you use it. This shirt was really small. I normally wear a small juniors or extra small women's, and, because of reviews I ordered up to a medium and I'm sending it back because it's too small. The colors were a bit brighter than I wanted or expected, the stars are only on the front of the shirt and the shirt is a brightish blue, not black as pictured. Very soft shirt and still cute enough I'll send for the right size, but size way up, ladies!